Strawberries | Honeywood (Dr. A. J. Porter) Heritage Nursery Inc.
– 1946 Price List description – Everbearing. This is our own origination and it seems to be winning a name for itself over a wide area. The fruit is large, very firm, attractive in appearance, and cans well. In hardiness it rates about with Gem here at Parkside. Both sorts require mulching before freeze-up. 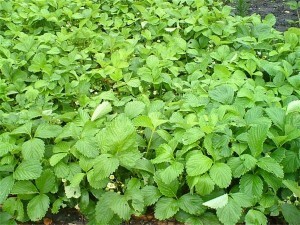 The plants are very large and vigorous and should be given generous spacing. Strong plants 10c each, not more than 25 per customer. 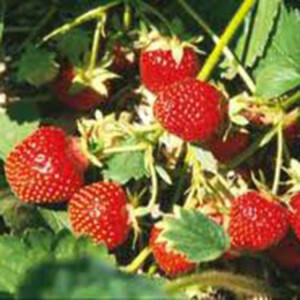 – 1947 Price List description – The most outstanding strawberry on our grounds since it first fruited in 1943. Visitors are amazed when they first see Pixie in full bearing. “Remarkable!” “Amazing!” “Revolutionary!” are a few of the words they have used. It is indeed a thrilling sight to see the rows red with fruit for the first time. Pixie will give a full commercial crop the first season planted. In May 1946, we planted two rows each of Pixie and Gem, side by side. Blossoms were picked off till the first of July. The first picking of Pixie was made on August 2nd of Gem on August 10th. A heavy frost on September 18th finished them. During that time Pixie yielded 453 pints, Gem 132 pints. Pixie berries are medium in size, firmer than Gem, bright glossy red in color, red to the centre. Plants are vigorous but not as large as those of Sparta, make runners freely for an everbearer, and have so far been fully as hardy as Gem here. – 1955 Price List description – New. This is a summer bearing sister of Parkland that has been outstanding here for the past five years. Plants are vigorous, productive and very hardy, retaining their vigor for several seasons. Fruit is of good size, moderately firm, bright scarlet in color, with the color extending right through the berry. Promising for home garden and local market. Jubilee will show its everbearing parentage some seasons by producing a few fruits in the fall. Limit of 50 plants per customer. – 1958 Price List description – A new hardy summer bearer. Vigorous and a good cropper. Much better quality than the Prince Albert sort we introduced a number of years ago. Porter’s Pride is being introduced this season by T and T Seeds, Winnipeg. Their stock is limited so if you wish to try this new sort place your order early with T and T.
Porter’s Pride is thriving at Honeywood and is usually found potted and ready for sale. We have a healthy Porter’s Pride patch in the Porter’s Memorial garden available for taste testing when ripe.